I’ve been running as part of a group on a Wednesday night on and off for about 18 months. 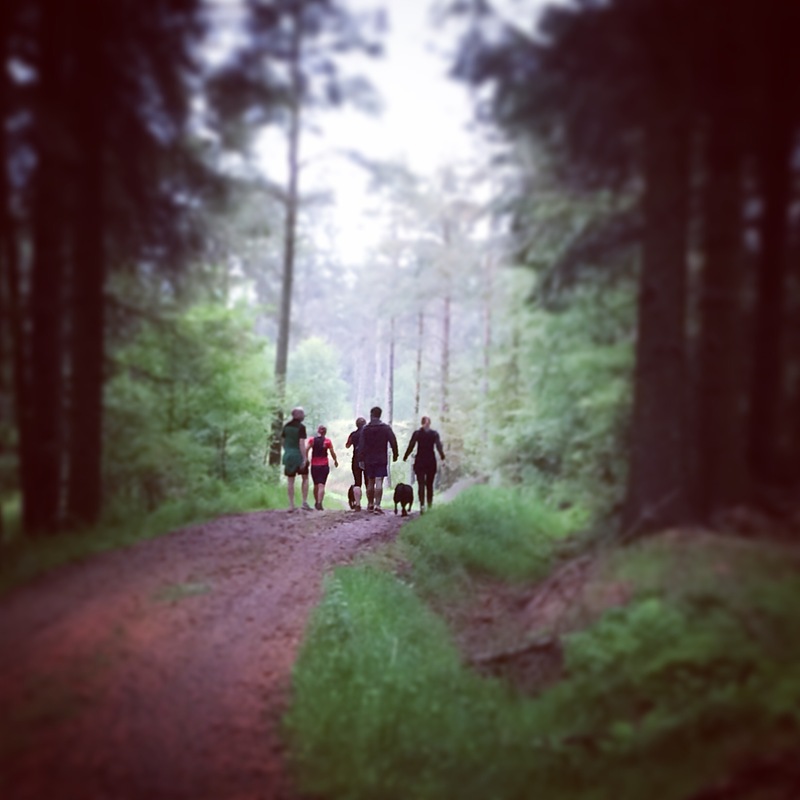 It’s not really a club, just a happy gaggle of people who run for the same reasons – a love of running, a love of dogs, a love of being out in the hills, a love of being somewhere new, a love of sharing it with friends, a love of supporting each other. Things petered out over the winter while I was ill, and then I lost all confidence in my running and didn’t want to play with the others any more. After the post-Fling running break, I decided to be brave and go back again. Last week, my friend J was put in charge. It was the last run before her wedding, so we left the pace and the route choice to her. J likes flat trails, although she is strong on the hills. She’s also getting back into training after a few niggly injuries, and although she is quite speedy, she wanted a really relaxed pace while she was building up the miles again for her next event. We met at the Falkirk Wheel, intending to run for about 6 miles or so. There was no fixed route, which was a little worrying as this is a group of people that prides itself on getting lost frequently. Those of us more confident in our route finding were well away from our normal patch and hence pretty clueless. We set off somewhat tentatively, but actually J was more confident than she let on, and a couple of hours later, we were making our way back to the car park, having done nearer 9 miles with lots of stops for chats and giggles and attending to dogs. The faster boys went off for a couple of leg stretches, but I think their ears must have been burning or they felt they were missing out, as they kept walking up the hills and drifting back to join the rest of us. It was a really weird kind of light, not dark at all but gloomy and misty. And then it rained. Jackets had come off early on as it was so warm. They didn’t go back on again despite the rain getting gradually heavier. There was something about the feel of summer rain on sweaty skin that was just too good to miss. We ran through damp misty forests, breathing in the smell of the pine trees and feeling the softness of the forest floor beneath our feet. When we came out of the tunnel above the wheel, the water was utterly, perfectly still. We were all full of excitement and good wishes for J, which added to the warmth of the evening. It was one of those brilliant nights where you have no idea where you’re going to end up, and sharing it made it all the more special. Of course, with this group, if everything went perfectly, something would be wrong. On our way out, we failed to notice the sign saying the little swing bridge would be shut at 8pm. We arrived at just gone 9pm, and there was a brief panic as to how we would get back. It was a bit too far to jump, and the detour was a good few miles long. Faces fell. A very crafty plan was put into action however, and all ended well.